The new, new MySpace’s latest promo video has certainly done a good job of achieving buzz and positive buzz at that…something that hasn’t been associated with the MySpace brand for a long time. Of course there is a big difference between a swish marketing video and the actual product, but the early signs are encouraging. Most specifically the strong focus on music. Back when MySpace was failing to fight off the inexorable rise of Facebook I argued that it was time for MySpace to stop pretending it was a social network anymore and instead start focusing on being a social platform for artists before it was too late. Of course they didn’t and before long it was indeed ‘too late’. Now they may well have another bite at the cake. The original MySpace was the trailblazer for bringing artists and their fans closer together, with countless artist success stories. It connected established artists with their audiences and gave aspiring singers, bands and producers the ability to reach global audiences. In the process it created an entirely new strata of semi-pro artists, too good for their garage but not good enough for a traditional record deal – the current staple of contemporary direct to fan services like TopSpin and Tunecore. MySpace changed the artist-fan relationship for good, transforming a one-directional shouting dynamic into a two-way conversation. ‘Bye bye’ email marketing list and static html website, ‘hello’ real time conversations with fans in a dynamic social environment. Unfortunately MySpace’s inability to give up the doomed fight for the mainstream social network audience also resulted in MySpace failing to innovate to stay ahead of the pack in the artist space too. An ill-fated foray into becoming streaming music service (when Spotify was but a glint in Daniel Ek’s eye) only hastened the demise. But what did for MySpace more than anything was the fact that artists soon realized that all of their fans were over on Facebook. It didn’t matter that Facebook lacked many of the artist-friendly features MySpace had, as those mattered little if your fans were elsewhere. Now, many years on, MySpace faces a much more sophisticated and complex competitive marketplace. The direct-to-fan arena which it helped create is now split across multiple categories and competitors, while Facebook is now firmly embedded in the music ecosystem. MySpace must now compete simultaneously with Facebook, Topspin, Mobile Roadie, Pledge Music, We Are Hunted and countless others. That’s without even considering the fight for the social networking consumer. MySpace is not about to usurp Facebook’s near 1 billion user lead (see my earlier post for why) but it can realistically aim to become the definitive destination for artists and their fans, combining the best of Facebook and Topspin et al into one rich immersive music consumption, discovery and engagement destination. Not necessarily instead of them, but instead a coexistence strategy, adding value to the existing value chain. MySpace also has significant legacy assets at its disposal. It remains one of the world’s most heavily trafficked music destination and has tens of thousands of artist accounts. Granted the lion’s share of those are inactive, but getting artists to reactivate existing accounts is a much easier task than getting them to start from scratch. MySpace is at risk of having had more regenerations than Doctor Who, but this latest one is simultaneously the one with the biggest set of challenges and potentially the best set of assets to compete with. First though, MySpace needs to understand what makes it unique, what would make an artist want to invest time on it in addition to or instead of the many alternatives. Then, and only then, MySpace can start competing, again. Regular readers will know I’m a big advocate of content platforms and ecosystems. Indeed device based ecosystems such as iTunes, Kindle and xBox are the success stories of paid content. More recently these platforms have been complemented by a new wave of ecosystems by the likes of Facebook and Spotify, that depend upon software and user data for walls instead of hardware. Both sets of ecosystems depend upon 3rd party developer and / publisher platforms for success. A thriving platform is one which is defined as much by 3rd parties as it is the host company. But just as a blossoming garden requires careful tending so does an ecosystem. The host has a responsibility to ensure that developers and publishers have the support, processes and transparency necessary to instill the confidence necessary for them to invest their time and resources into the platform. It is a responsibility that does not always come cheaply to the hosts and isn’t always respected to the full, as we have seen with the impact of Facebook’s Timeline on a number of artist app developers. Facebook’s Timeline feature is looking like a great innovation from the social networking behemoth and there are many examples of artists, music services and music publications using the feature to great effect. (Take a look at Spotify’s Facebook Timeline for a super cool implementation). However the way in which Timeline was implemented on artist pages has had a dramatic cooling effect on what was beginning to shape up to be a vibrant community of Facebook artist app developers. Latest data from AppData.com and reported on Digital Music News shows that Band Page (formerly Root Music), Reverb Nation and FanRX (formerly BandRX) all saw a steady decline in usage in the lead in to the Timeline switchover date and then a ‘falling off a cliff’ drop on the date itself. All three apps have remained stuck at their decimated levels. The key reason for the collapse in user numbers is that as part of the Timeline feature Facebook prevented these apps being able to act as the landing page for artist profiles. There is very well thought out reasoning for this move: Facebook remembers only too well the anarchic chaos of MySpace artist pages, indeed the pared-down minimalism of Facebook’s UI was an intentional antidote to MySpace messiness. But none of this detracts from the fact that Facebook has failed to fulfil its duties as platform host. It should have done more to accommodate the concerns of artist app developers and would be well advised to work with them now to improve their lot. Although it would be stretching credulity to claim these apps were responsible for artists switching from MySpace to Facebook, they certainly played an important role in easing the transition for many. If Facebook is serious about becoming a platform for music, it needs to ensure that it doesn’t just lay out the red carpet for Swedish streaming services. The value of Facebook as a music platform will come from the functionality, utility and experience delivered by 3rd party apps that help artists differentiate the way they engage with fans. Apps such as Band Page, Reverb Nation, Fan RX and Bopler Games. Ensuring that strategic priorities can be implemented without destroying the livelihoods of developers is a key responsibility of platform hosts. Of course sometimes hosts patently ignore the responsibility and use app developers as free R&D – just think about the number of times Apple has killed off app companies by integrating their functionality directly into iOS. But even Apple knows you can only do that so many times before you risk killing the proverbial golden goose. I continue to maintain that Facebook’s platform strategy is subtly brilliant, and in the bigger scheme of things the artist app Timeline debacle is pretty small fry. But if Facebook is to establish itself as a genuine music platform it must learn from the lessons Band Page et al are painfully teaching. As the market collectively holds its breath in anticipation of Facebook’s much (over?) hyped music service launch this coming Thursday, it is instructive to take stock of where we are at the moment to better understand the eager expectation. Paid downloads are an Apple micro-economy not a marketplace. Despite valiant efforts from the likes of 7 Digital and Amazon, the 99 cent download just isn’t translating well outside of the iTunes ecosystem. Why? Because the tail is wagging the dog. iTunes downloads are an extension of i-devices not vice versa. The iTunes 99 cent download is effectively monetized CRM. Deep, elegant device integration is crucial for any digital music experience, especially so paid downloads. 7 Digital’s Music Hub build for Samsung’s Galaxy Tab is the sort of implementation needed, but both 7 Digital and the market as a whole need a much wider addressable base than Galaxies alone (retail embargoes notwithstanding). Premium rentals are an evolutionary dead-end. Despite Spotify doing a most admirable job of breaking the 1 million premium subscribers mark – which all other services had spent years failing to do – the fact remains that 9.99 rented music is a high-end aficionado market. Spotify have done a great job of building on the fantastic pioneering work of Rhapsody but in doing so they have developed the ‘faster horse’ that Henry Ford said his customers would have requested instead of the Model T if he’d asked them what they wanted. Rdio and Mog both have great user experiences but have struggled to make headway because the basic value proposition of 9.99 a month for rented music just doesn’t appeal to most consumers. Heck, 9.99 a month for owned music doesn’t even appeal anymore to most consumers anymore. Mass market consumers may be willing to pay much more than 9.99 a month on TV, broadband, mobile etc. but they won’t for music. It may not be pretty but this is the harsh reality that must be accepted. 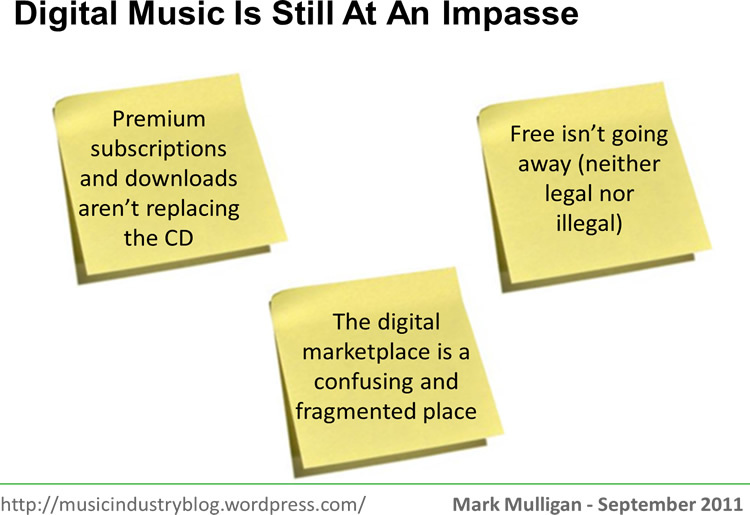 As far as music is concerned the contagion of free is legion and the best way to fight free is with free itself (or at least something that feels like free – see my previous post on subsidized subscriptions for more). Digital music is cluttered and complex. There is so much choice of catalogue and services that paradoxically there is no choice at all for consumers, unless you’re a savvy aficionado willing to wade your way through the clutter. Mass market consumers need the digital dots joining. Back in my days at Forrester I wrote about the need for 360 Degree Music Experiences, where the disparate parts of the digital music journey get pulled together by an interconnected ecosystem. The case for this is even stronger now. And this is where Facebook comes in. As I wrote earlier this year, it doesn’t make any sense for Facebook to try to ‘do a MySpace’ or for that matter to ‘do a Spotify’ or ‘do an iTunes’. Facebook is becoming a launch pad for our online lives just as Google is. But whereas Google largely gets us to places we don’t yet know, Facebook is what (and who) we do know. And in that lies a massive asset for digital music and an even larger platform for Facebook’s future growth. I expect Facebook to join music’s digital dots and become a social dashboard for digital music activity. By plugging our music activity into our social graph Facebook can both enrich those services and tap into the tastes of our friends. The net result will be a richer digital music experience across multiple services and – most crucially for Mark Zuckerberg – one more reason why we’ll want to stick with Facebook when the Facebook-Killer finally raises its long overdue head. Yesterday fan funded band site Sellaband was declared bankrupt by a Dutch court. This may be ‘just another digital music start up that burnt through its investment money with no proven business model’ but its demise is disappointing. Semi-pro sites and services are a crucial part of the digital music ecosystem and despite this setback they will grow in importance. Services like Sellaband, MyMajorCompany, TuneCore, Sound Cloud and MySpace, each in their own way, lower the barriers in the artist-fan relationship. They enable artists to reach out directly to their audiences and develop engaged relationships that make the fans feel a part of things. The shift from photocopied fanclub newsletters mailed in the post, to active online fan communities is little short of a quantum leap. The advent of social music tools are the music business equivalent of the transition from the stone age to the bronze age. Of course if you follow my analogy on, there’s still a lot of distance to go before we reach the iron age and beyond. SellaBand wasn’t the first high profile victim (anyone remember Snocap?) and it won’t be the last. “be their year” I didn’t expect SellaBand’s demise either. I remain convinced of the potential of thesesorts of services and it is crucial for artists and the music industry more broadly that these social music tools prosper. If they don’t then so much of the Internet’s potential remains untapped.